Q: How was your life before you came to PV? Sister Phu Nghiem: I have a sister and an aunt who have been monastic sisters in the Plum Village tradition since the 90s, so I often visited them at Deer Park Monastery, or the Green Mountain Dharma Center (a former center in Vermont, US) before they moved to Blue Cliff Monastery. That’s how our family was introduced to the Plum Village tradition. Before I ordained, I was working at a small interior design firm; then, I visited Green Mountain Dharma Center, and it felt nice. Then I visited Deer Park Monastery, and it felt nicer. Finally, I visited Plum Village and ordained as a monastic there. Q: When did you ordain? Q: For the last ten years as a monastic sister, how is practicing as a monastic different from practicing as a lay friend? PN: I don’t think I was practicing as a lay friend, so I can’t say what’s different. I grew up in a family with rich cultures. We celebrated many holidays with different values. That was how my parents transmitted these values to us. I didn’t understand this when I lived at home. But now after practicing PV traditions and celebrating holidays here, I have come to understand that celebrating a holiday or a special date is to accept who we are, to accept our ancestors, to remember them, and to know that we are not alone in this world. We have our root and our family (blood/spiritual). I did not think I practiced to come back to myself and experience interbeing, but this was how we were raised. Q: You became committed when you were already on the monastic path? PN: I stayed at Deer Park Monastery for two years as a lay friend, because my aspiration was already to ordain. There, I was already in the environment. Q: Did you have the practice as a lay person as if you were in a monastery? Q: Was it nice that Wake Up already existed at that time? PN: It started in 2008 after I ordained. Q: I see. Can you share a little bit about living with monastics—what are the manners? PN: Eating mindful is helpful; to eat mindfully is to not think about the past or complain about the future. I find this helpful, but as a practitioner, I have to come up with concrete things, to take action with eating so that they become more nourishing and beneficial in the practice. One of the things I do is that after I take a spoonful of something, I completely drop the spoon. I notice if I am able to do that, I feel freer from wandering into the past or thinking about the future. The manner about not talking while walking; that is a tough one [laughs.] When I manage to do this, it is less stressful; life has become less stressful. Q: Thank you for sharing those concrete practices—to break the dynamic of eating by putting the spoon down. PN: We have to be creative; as young people, we have to do things that work for us. Q: I saw you in the summer retreat helping with the Dutch children in the children’s program. I wonder when you commit to monastic life, it is clear that you are not going to have your own family. Is that an issue that sometimes crosses your mind: not having your own children? PN: Not visible enough to say that it disturbs my practices. I feel nourished by the kids. I think they are great practitioners; they are honest and truthful to their life. Thay often says that we are a wonder on Earth. When I play with the kids, I see that. They are a wonder. I feel it is more challenging to do that as an adult. Every time I think about them, their way of being nourishes me. It is real; that’s how I want to live. When I am with them, I enjoy them, and they enjoy me. Q: Do you have a special practice for challenging times? PN: I put myself in nature. I have a hammock in the plum orchard of Lower Hamlet. The sisters helped me created a small garden in front of my bedroom. Some of my favorite flowers and stone designs are in the garden. I put a chair in that little garden that has a view of the plum orchard and the forest. I often sit there and look at the beauty of nature. It becomes my focus of meditation. Just by doing that, my stress and worry naturally dissipate. I become more calm and remind myself to come back to my breathing. I begin to feel more at peace within myself. If I am stressful or too tired to sit, I lie down on my hammock and I do the same. Q: How beautiful. What would you say to someone who’s thinking about the 5-year monastic program? 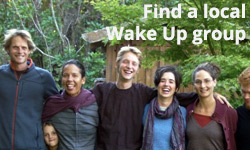 PN: I would say “Come and play with us,” especially join us for the Wake Up retreat and be part of the Sangha. It’s like before you go to university; you’ve got to check out all the universities you want to go to. You come to the university and look around at the environment and all the classes that you want to take. You ask people about the universe and talk to your counselor about it. I think it is a similar thing with the 5-year monastic program, whether you might want to join for five years or for your whole life.